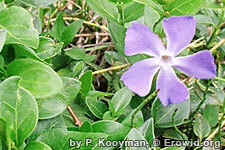 Periwinkle is a very common creeping perennial with dark green leaves and white, pink, to purple flowers. It has a long history of use, although it is not commonly used as an herbal remedy in modern treatments. The plant contains alkaloids and tannins, with a major alkaloid being vincamine, related to the semisynthetic vinpocetine.